"Language Is More than Culture and Culture Is More than Language"
have learning content and texts taken from the local culture written in the local language. This model is, however, seldom found. The above is the abstract from a paper by Birgit Brock-Utne from the Institute for Educational Research at the University of Oslo (http://www.netreed.uio.no/conferences/conf2005/Birgits%20paper.pdf). This paper is so relevant to one of the issues Philippine basic education faces. It is an issue that has lingered for several decades. Data do not indicate that the medium of instruction plays a major role in the high dropout rate in Philippine schools. However, there is a clear need to take action to preserve and nurture the nation's diverse set of languages and culture. "We should become tri-lingual as a country. Learn English well and connect to the World. Learn Filipino well and connect to our country. Retain your dialect and connect to your heritage." The languages in the Philippines, at least in the written form, are not as dramatically different from English as other languages in Asia. Most of the languages in the Philippines use Roman letters and numbers are Hindu-Arabic. This is in striking contrast to its neighbors like China, Vietnam and Thailand. Spanish colonization for hundreds of years has shaped the Philippines into a nation quite distinct from its neighbors. Nonetheless, even after hundreds of years, there still lives a unique Filipino culture, rich in tradition and heritage. "....There is a lot of controversy on the medium of instruction in schools. A cursory search of the Net reveals multiple viewpoints, backed by studies big and small. 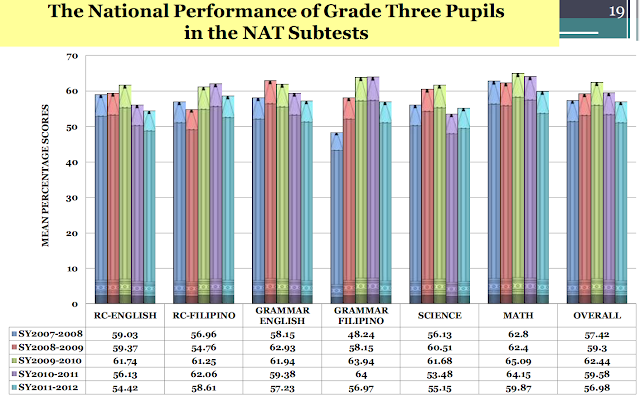 I prefer to defer to the Singaporeans, the best in the world in math and science (and excellent in English). In melting-pot Singapore, English is a required language starting from preschool. Textbooks in the major subjects are in English. But students have to master another language, most likely their native tongue, whether Mandarin Chinese, Malay or Indian, which are taught in culture classes. There has been a move in our country recently, backed by Unesco, among others, to use the mother tongue in the early grades. On the whole, I think this has merit, but unless good math textbooks, for example, are available in the mother tongue for preschool and first grade, then this move may be premature...."
At the end of a talk by Dr. Milwida M. Guevara, Synergeia’s President and Chief Executive Officer, years ago in a meeting sponsored by Johns Hopkins University, she noted that text that uses pizza to teach children fractions do not help much since some Filipino children have not seen pizza pies. Perhaps, it would have been more helpful to use "bibingka" (a type of rice cake from the Philippines). This is a very simple example of what Brock-Utne is saying about going beyond the language in using it as a medium of instruction. It is the best model yet it is rarely found around the world. The reason is that it requires a lot of resources to produce learning materials that not only uses the mother tongue of the pupils, but also makes use of experiences or instances that are local or familiar to the students. 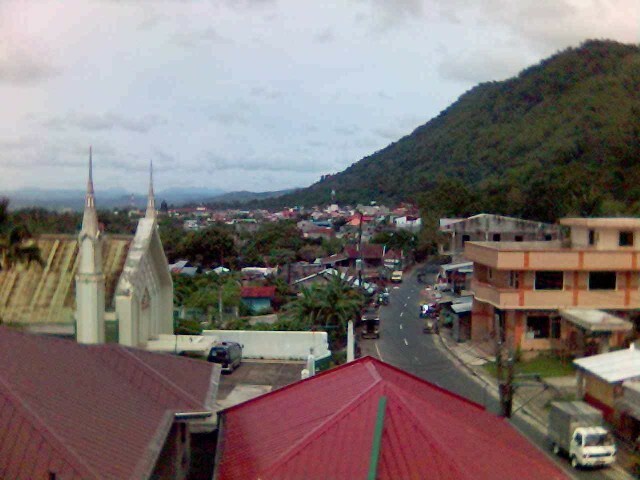 I left the Philippines in 1987 but I had visited years ago and spent quite sometime in Paete, Laguna. I was amazed at how popular some of the American shows are in the Philippines. I am sure that this may not be the case for regions that are more remote, especially those which do not have electricity. Nonetheless, I would not be surprised that some Filipino children would know much more about NBA players than I do. But since I have a 5-year old son, I probably could compete with Filipino children on shows that cater to young viewers. I still know much of the trains of Sodor, their names and respective numbers. The true test of the science lessons (http://paete.org/forums/viewforum.php?f=12) lies in our daily lives. 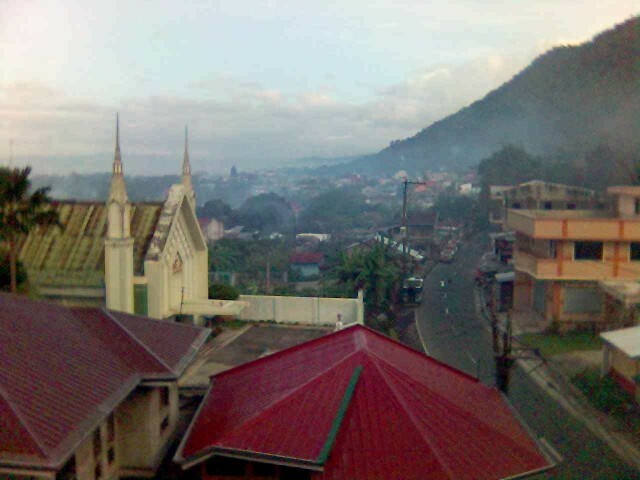 Paete is unique in its great presence on the internet. Both forum and the private mailing list witness lively conversations among Paetenians. Our understanding of science will be revealed by the conversations we carry. Science will touch almost every issue we need to face in the future. Our politics will reflect how much we understand science as we try to tackle the various challenges Paete is facing. Our choices will reveal the real scores. It is in the way we face issues that are relevant for the well-being of Paete, will we see our understanding of science. Economics is important. Livelihood projects are necessary as Paete addresses issues of poverty. The mayor has recently outlined various livelihood programs. Under each of these programs, there are science lessons that are now available. These lessons may be helpful in understanding what these programs entail. We have an on going tilapia hatchery in our river near the mouth of the lake. We have completed the seminar on tinapang tilapia. Our plan is to supply raw tilapia to the people and the Municipio will buy the tinapa from them. We will handle the packaging and marketing to major supermarkets in Metro Manila. Raw (live) tilapia would cost Php 50 / kg of 6 pcs per kilo. We can sell the tinapa (6 pcs/kg) for Php 90-100. Charcoal briquette production from bio waste is also one livelihood project that we are pursuing right now. At the moment, we have one set of machine ( locally manufactured at Php 90,000 / set) producing 60 kg of charcoal briquette per day. Raw materials are free, and almost unlimited i.e. water lily, coconut husk, palay husk; busil ng mais; banana leaves, etc. We are selling the briquetted charcoal at Php 20 per kg. Upgraded "Bower breed" of goats will be raised at sitio Papatahan. We are planning to develop a 10 hectare area for this purpose. We will start with 20 does worth Php 10,000 each and one ram worth Php 25,000. Rate of kidding is 1-2 kids twice a year. We can sell the goats at Php 4,000 per head at 4 months old. Milk can be marketed at Php 30 per litter. Because of coffee shortage in the country (according to NESTLE Phil), this is becoming a popular agri venture in Paete. About thirteen (13) hectares in sitio Macumbo and Sta. Ana are already planted with coffee. The first harvest is expected middle of next year. This is a flagship project of our Municipal Dept. of Agriculture. We have idenfified 15 lanzones plantation with an average area of 1,000 sq. meters each to be rehabilitated. Prunning, scraping of barks, proper irrigation, and fertilizer application are some of the procedures for the rehabilitation program. After a year, we expect significant improvement in production. The second phase is expansion. Grafted lanzones will be distributed to upland farmers which are expected to bear fruits within 7 years as compared to 25 years starting from seeds. A 4 hectare demonstration farm in sitio Macumbo is earmarked for this project. It will be a tripartite agreement between the Municipality of Paete, the private lot owner and the Eco-system Research and Development Bureau of DENR. The MOA is expected to be signed within this year. About 50 different species of bamboo (including ornamental) will be propagated in the demo farm. The bamboo will be an alternative material for wood for our handicraft industry. Batikuling, the major wood species used by our wood carvers together with other species such as "gemilina" will be cloned and planted in the 4 hectare demo farm. While waiting for these woods to mature, as a continuous source of raw material for our wood carving industry, inter cropping of high value crops such as herbal/ medicinal plants, corn, garlic, peanut etc will be part of the livelihood project of the farmers. The seminars for Bamboo setum propagation and Batikuling cloning have been conducted by ERDB last month. The true test of how much science we are understanding will lie in the decisions that we make in the future. It will be evident in the conversations that we share. It will show, without any doubt, in how we live our lives. Science education in the mother tongue should go much deeper than just using the local language. And in the same token, nurturing the mother tongue and culture is so much more than using it as a medium of instruction in early childhood education. The preservation of one's culture rests on higher education. Studies on the mother tongue (literature, traditions, culture, arts) need to be promoted in colleges and universities. There should be courses in universities that focus on the literature and culture of the various regions of the country. Higher education is the proper place to cultivate the various languages of the nation. And it is only from this environment, would the country gain enough manpower to advance a genuine mother tongue based education. It is only through scholarly work that these languages will prosper and reach the academic level. This is where the first step needs to be taken. Much of the drive towards mother tongue instruction comes from the fear that the use of a foreign language demotes the native language and culture. What will promote local language and culture is not instruction in the early years but the existence of scholars and researchers in the field. Only with expertise in the mother tongue and culture, would the Philippines have the required teachers to implement mother tongue based - multilingual education. 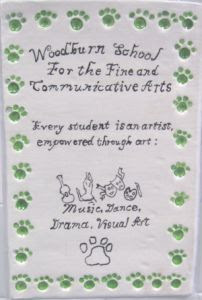 "Woodburn teachers strive to integrate the fine and communicative arts into all instruction throughout the school day. We believe that arts integration enhances learning for all students, particularly visual, tactile, and kinesthetic learners, and those whose home language is not English. Using the arts to learn more traditional academic subjects provide natural connections for differentiating instruction to meet the needs of all students. Music, drama, visual arts and poetry, for example, are major tools that appeal to the visual tactile, auditory and kinesthetic learners' needs. This provides students with multiple ways to remember, transfer and apply their learning. When the arts are integrated into academic subjects, instruction is likely to be more active, hands-on, personally meaningful and vivid for students - all research-based techniques proven to increase the rate and retention of student learning. Educating students using the arts also provides a foundation for their appreciation of and participation in the arts as life-long learners." The Philippine Congress should realize that mother tongue based multilingual education can not be realized by simple legislation and DepEd should not use this aspect to promote its new K to 12 curriculum. Both actions will only do harm to the country's treasured culture. "For it to be useful to as many countries as possible, the guide is based on a general conceptual design. However, since the concern is to show that the introduction of African languages and cultures in education is feasible in Africa today, the guide draws inspiration from concrete cases of the African reality and, more specifically, from success stories in the area under consideration. To that end, the guide is based on a set of assumptions. • A “fictitious” country: This guide does not explicitly mention any country. However, it refers to the experiment of a multilingual basic education continuum in a country of Francophone West Africa. This continuum comprises three elements: A nursery (3 years), en elementary school (5 years), post‐primary education (4 years). • The use of African languages as media of instruction‐learning is a decision obtained in the framework law on education and its implementing orders now need to be issued. • The use of African languages as a media of instruction – learning is a constituent of a more extensive programme, that of the global reform of the education system without which the use of national languages would not have a solid basis. • The model of bilingualism adopted in this guide is additive bilingualism. Contrary to the widespread practice consisting in using African languages during the first two or three years of schooling and abandoning them immediately after to switch to a foreign language, this guide suggests the coexistence of the national African language and French throughout primary school and during the early part of the post‐primary cycle, in proportions that are well defined in the contribution of each medium to learning. • The experiment envisaged here covers a 10 year period: a primary education cycle of 6 years and 4 years of post‐primary education which generally corresponds to the junior secondary level. The pilot program, covering about 100 schools and 600 teachers and five languages, costs about US$ 11 million. ONE SIGNIFICANT aspect of the K to 12 Program of the Department of Education is the use of the child’s native language during the first three years of his schooling. In our case that is Hiligaynon. It is believed that the use of the native tongue for toddlers and children hastens understanding of concepts and the absorption of knowledge compared to English, a second language or now considered a third language because the emphasis is on Tagalog or euphemistically called Filipino but fundamentally Tagalog. There are opponents of this program, not the least of which is the use of the native language. Some felt that the non-Tagalog children will be disadvantaged because they had to study two national languages – Tagalog and Hiligaynon while those of the Tagalog region will not be burdened by another language. English will also be introduced gradually thus the Visayan child will be studying three language to the Tagalog’s two. In private school, the children will also have the advantage of getting English ahead of those in the public schools so that those in the public school will again be disadvantaged. One militant group claims the use of the native tongue in public school and English in private school is anti-poor. Anyway that is just another opinion. We have one problem with the use of Hiligaynon. What kind of alphabet shall we use and what are the rules of grammar to guide in the formulation of sentences or the spelling of native words? Let us take the case of tao or should it be tawo to refer to man or person. Spoken, the difference is not so perceptible but written, which is the correct spelling? If spelled astao, then the pronunciation will be different from that of tawo. Even the commonly used word as barangay can be problematic. Is this the correct spelling as it is pronounced? 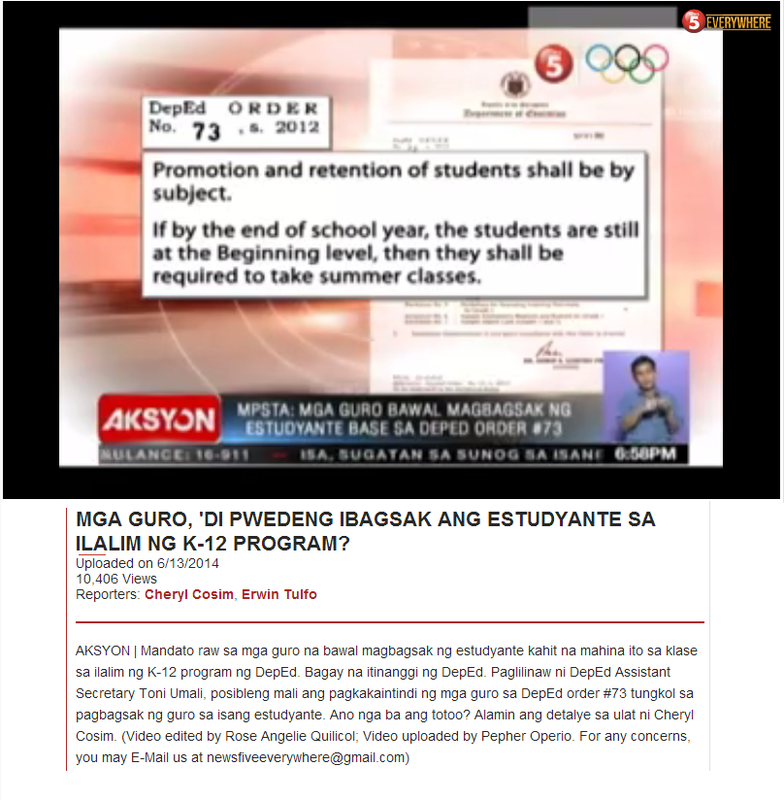 Or should we use baranggay to make it right? The way we spell this word now, the pronunciation is different – ba-ra-ngay. The problem in the use of the native Hiligaynon is that, unlike English, there is no standard dictionary or rules of grammar. Take the case of our common way of saying, “kadto ka lang di.” Translated to English this should read “just go here.” This is grammatically wrong, but it is right when spoken as we mostly do. What kind of reading material shall we use that has the right spelling and grammar as in the spoken language? Has DepEd already printed this reading material for our kids or will the subjects, using Hiligaynon rely on the popularly spoken, albeit grammatically incorrectly constructed sentences and pronunciation or wrongly spelled words? I have not seen any Hiligaynon educational material but considering the absence of a dictionary and standard rules of grammar I wonder what kind of material will be used. There is also the problem of terminologies. Which one will prevail? Shall we say “dyip” for the passenger jeep or use the right spelling “jeep” which is also a concoction of “general purpose (gp) vehicle”? How about “titser”? Should we continue to use this or insist on the right English “teacher”? In arithmetic we can have a problem. Shall we use the English numbers or the Hiligaynon, “isa”, “duha”, “tatlo” and “duha ka pulo ug (pulog) lima”? As mandated the teacher has to use the native numbers but parents had already been using the English numbers even before the child could walk. Of course we know the “close, open, close, open” ritual for babies even in the rural areas. It would be interesting for our local officials to take a look at the materials to be used in the lowest rung of the educational system because we could be creating more confusion and miseducation at this low level of the ladder rather than help improve the system. Language is vital in education, that is a given, but language must be taught right. We insist on correct grammatical construction of sentences, logical presentation of thought and proper use the words to convey the right meaning. Language, properly understood and conveyed is one of the main, if not the initial requirement for higher education. While we agree with education officials on the efficacy of native language use at the lower level there are circumstances in our case that are not present in other countries, for instance the level of development of the native language. As I noted earlier, we do not have the approved dictionary and rules of grammar that insure that the native language that we use and teach is the right one. I can cite hundreds of differences in our language use – written and spoken that will put a lot of stress on our teachers as to which is correct. Without an accepted dictionary or grammar what will guide the teachers? This is about loving your homeland, if you love your language you also love it's culture... love you all!